A rare expanse of public greenery in the heart of the city, it was once property of King Rama VI, who issued a royal command to turn the area into a public park as a gift to Bangkok's residents. A rare expanse of public greenery in the heart of the city, it was once property of King Rama VI, who issued a royal command to turn the area into a public park as a gift to Bangkok's residents. The park's symbol, a statue of its creator King Rama VI, stands at the main entrance at the southwestern corner, right opposite MRT Si Lom station. 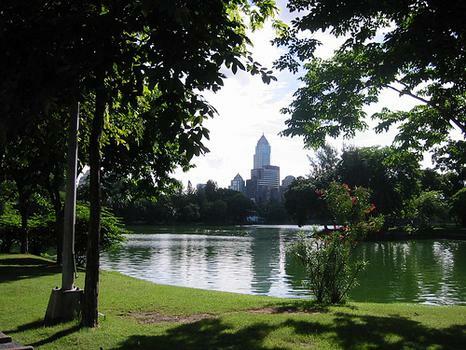 The park has a lake with boats for rent and with a cycle track around it, and is popular among early-morning fitness enthusiasts, but there's little reason to wander in during the daytime heat. The Bangkok Symphony Orchestra does, however, put on occasional performances in the winter. There are rather large lizards in the park - they are well worth a look. They tend to spend most of their time in the water of the lake. Do not get too close to one, as they can bite.